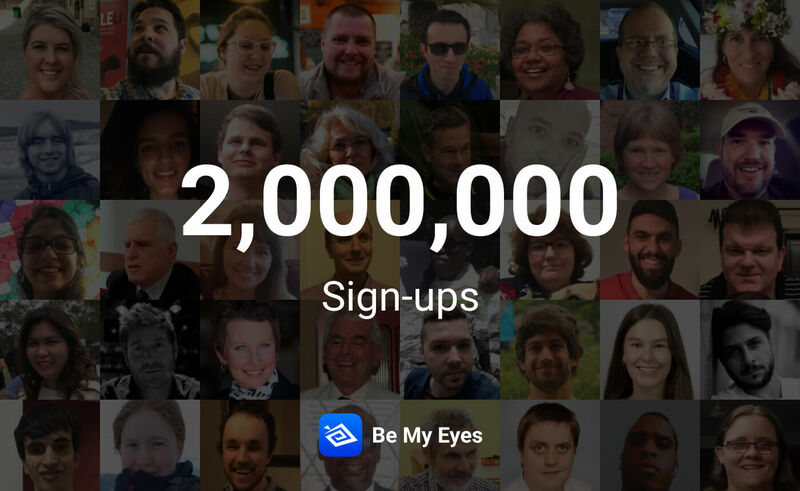 The Be My Eyes Community has reached the astonishing number of 2 million sign-ups, and we are thrilled to discover what will come next! Picture with a collage of the volunteers' and blind and low-vision users' faces in the background. In the foreground, the image reads: “ 2,000,000 Sign-ups” with the Be My Eyes logo at the bottom. It hasn’t been long since we celebrated our fourth birthday, a great occasion for us to thank all of you for the incredible support you have been giving us with your small acts of kindness. We’re already fortunate enough to celebrate another unbelievable milestone: we’ve reached the astonishing number of 2 million sign-ups, 2 million people linked to each other in this unique and special community. This event is really important to us, with it being another demonstration of the love and dedication of our community, which allows us to reach and help more people. You are the heart of Be My Eyes, and it is thanks to all of you that we have been able to reach such an incredible result. When our mission to make an impact in people's lives started four years ago, we had never imagined coming this far, but here we are. To celebrate this result, we’ve decided to have a look at some of the achievements we have been able to reach with your support in just four years. The Be My Eyes Community can currently rely on people from more than 150 different countries. Almost every country is represented, from India to Canada, from China to Brazil. The Be My Eyes Community is present in every part of the world, and each day more people are joining the family! And there’s more! Our users speak more than 180 languages, making us able to link people from everywhere in the world, overcoming cultural and communication barriers, working together as a unique organism. The love and generosity of our community bring us all together despite the distance, collaborating to reach our shared goal. Everyday, more than 1,000 people are linked through the Be My Eyes app, creating special and significant connections between volunteers and blind and low-vision users. These calls connect people in a unique way, helping us make the world a more accessible place for everyone. This is what 2 million people have been able to achieve in four years. For us, these are not only numbers, but the demonstration of the Be My Eyes Community’s dedication to our cause. We promise that we will continue to bring even more features to all of you: with the introduction of Specialized Help, Community Stories and the ongoing support of our app, we are already aiming at our next milestone. We want to keep improving and deliver a better service to everyone, and we know we will be able to reach our goals with your support and trust. To all of you, thank you and don’t forget to keep on spreading the word!